Now we have the worm wheel blank faced and the outer diameter cleaned up and the shaft hole bored out slightly undersize. We now need to turn down the outer diameter to the correct size. We are making a 360 tooth worm wheel, with a pitch of 1.5mm on the worm gear. You may immediately think that the correct outer diameter for the worm wheel is 360*1.5 / PI = 171.89mm. However, it is not this simple. If you make your worm wheel blank this diameter, you will end up with a low tooth count, it will not self index in the hobbing stage and you'll just get a mess. 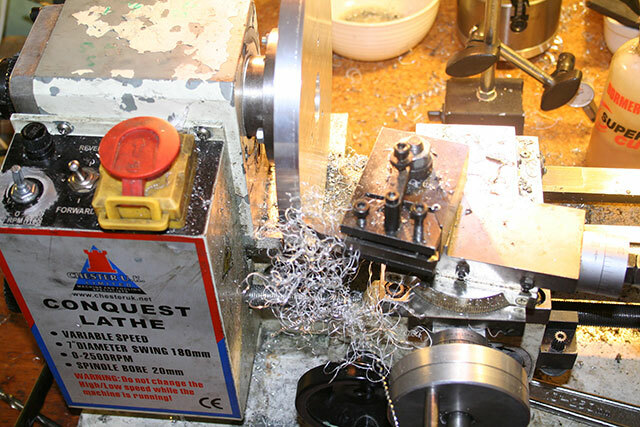 To eliminate the risk of the part shifting, we need to make each of the three cuts leaving a small amount of metal to be removed - finally we go around the three cuts again making very light finishing cuts. The next step is to turn down the outer diameter to about 174mm. You need to fiddle about with a right hand turning tool mounted backwards in the tool post to reach the outer diameter. Take very small cuts - because of the large diameter, there is a lot of metal to remove, even advancing the tool by a few thou. The last thing you want is the tool digging and and stalling - this will disturb the somewhat rickety mounting of the part. The last part is to face the unfinished front. Make a good finish. 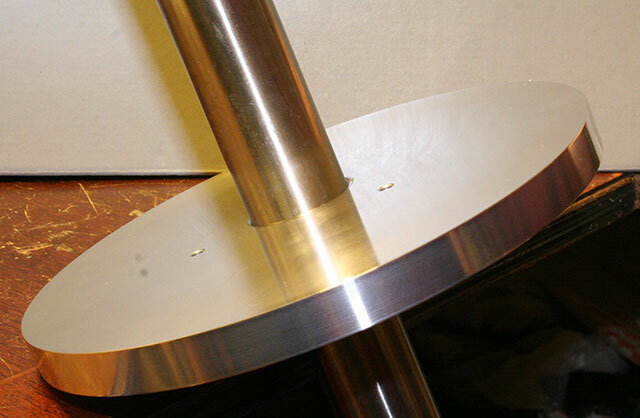 Now turn back to the boring bar, and bore out the inner diameter to the required size. I am using a 30mm diameter shaft, and I want the worm wheel to turn freely on the shaft, so I keep taking a tiny amount off until the lubricated shaft turns easily in the hole. Finally we turn down the outer diameter to exactly 172.84mm or 6.8047 inches. Using a 6-7 inch micrometer, you should be able to get this within a thousandth of a inch. This is the most important dimension to get correct. Each thousandth of an inch of diameter corresponds to about 0.08mm of circumference - about a 1/15 of a screw pitch (pitch is 1.5mm). It is nice to polish the outer diameter to make future indicating easier - I also clean up the face with a bit of polish. The two faces are NOT parallel to each other, only one of the faces is concentric to the bore and outer diameter, so it is important to polish the concentric face, so it is easily identified in the future. It is also worth scratching a mark on the less face for identification purposes. 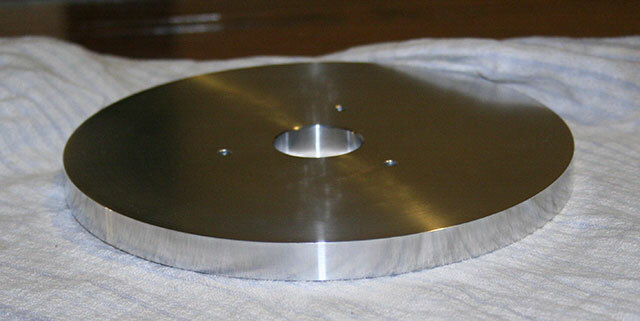 Finally we have the completed telescope worm wheel blank. The outer diameter is correct for the gear count we require, and the front face and the inner and outer diameters are perfectly concentric, at least as close as we get get on a mini-lathe, and that is the best we can hope for. The worm wheel blank is now ready for gashing.